1979 is a political thriller – but not like that. The (rise and) fall of one of Canada’s most forgotten and forgettable leaders sounds more like a mischievous improv prompt or DVR description for a History show than a recipe for gripping theatre – but it works. It’s easy to see why the production went down so well in its Shaw Festival form and in its playwright-produced incarnation here. Making a work like this informative yet entertaining tests not just writers and directors but also the performers Christopher Hunt and Jamie Konchak who, between them, portray the vast array of friends, enemies, and somethings-in-between who visit upon Philip Riccio’s brilliant and beleaguered Joe Clark in his government’s dying days. This rapid switching between roles – and genders! – is a challenge that Hunt and Konchak meet with impressive confidence. In particular, Hunt steals the show as a chainsaw-wielding Pierre Trudeau sultrily strutting across the stage to deliver imperious lectures to his captive audience. 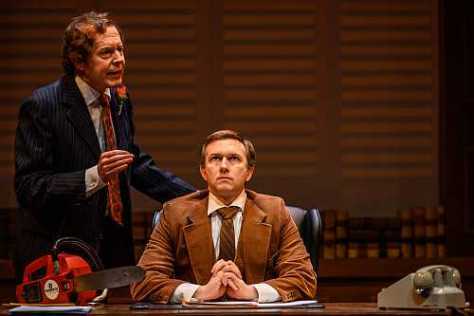 These tonal shifts are aided by the clever use of text projections, giving the relevant history and unpacking the dry arithmetic of parliamentary procedure while keeping the mood light-hearted and letting the audience in on the joke. Although many audience members clearly had their own memories of Clark and his times, as a young buck who arrived on these shores only months ago I still found the play accessible – largely thanks to these fun summaries – and highly enjoyable. Curiously, the weakest point of 1979 is its omen of the 2000s. After admitting to fudging the dates to make the maths work, the play introduces a young Stephen Harper as an eager assistant with strong Thatcherite conviction, acting as a Ghost of Conservatism Yet to Come. I found myself in the opposite position from almost everyone else in the audience, as a Brit with extensive experience of the debate around Thatcher and only faintly-formed ideas about Stephen Harper. From that perspective, the inclusion of Harper suggested a lack of faith in the show’s premise to remain engaging without a familiar hate figure for Canadian theatre audiences. The Thatcher references – some more historically accurate than others – fell flat, or at least felt unnecessary. 1979, like Clark and so many of us – but absolutely not Pierre Trudeau – just needs to have more confidence in itself.